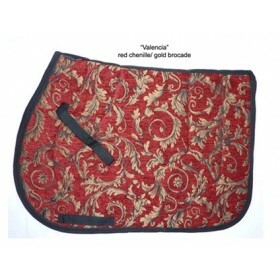 Elegant English saddle pad. US-made, pretty red chenille with gold brocade woven in. Our pads are contoured to fit your horse's back properly. We use a breathable, durable, heavy weight cotton underside, nice foam center and heavy black webbing on billet loops, girth straps and binding.